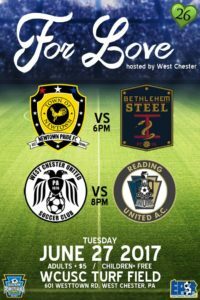 Tomorrow night, there will be a benefit doubleheader — two games for one cause — for soccer enthusiasts who live near, or travel to, West Chester in Chester County, Pennsylvania. To soccer fans in southeastern Pennsylvania, benefit games populate a reality that is primarily virtual and not North American, an example being a recent benefit honoring retiring long-time Manchester United mainstay Michael Carrick at Old Trafford. Connecticut’s Michael and Matt Svanda, and the Keystone State’s Blaise Santangelo and their respective clubs are changing that pattern. 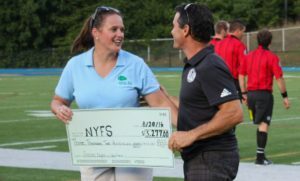 The father-and-son team from United States Adult Soccer Association amateur side Newtown Pride FC, of Newtown, Connecticut, and the West Chester United National Professional Soccer League side’s head coach are taking the concept and making it actual. Individuals who continue to struggle with the consequences of the Sandy Hook Elementary School tragedy in 2012 will benefit from the direct expressions of love and awareness that will occur. And so will the local Connecticut agency, Newtown Youth and Family Services, which provides needed on-going help to both survivors and the local community generally. They will receive the material proceeds. The gates for “Soccer night in PA for Sandy Hook” open at 5:00 PM at the soccer complex at 601 Westtown Road — where Westtown Road crosses under the West Chester by-pass (U. S. Routes 202 and 322) — adjacent to the Government Services Building, Tuesday evening June 27. Parking is in the Government Services Building lot. The rain date is Wednesday evening June 28. Adults are asked for a $5 donation. Children under 18 are asked to enjoy their opportunities. Other entertainment includes the following. Some members of the Downingtown East High School Marching Band will perform. The Bethlehem Steel’s collection of large blowup play devices for children can be enjoyed. The Downingtown East Arts Program led by Becky Lister will provide face painting. A local fire truck, or possibly other emergency service vehicles, will be available for inspection. And food trucks will satisfy appetites. Some first-responders and children from the Newtown, CT area will attend, as will a representative of the service agency. Local first responders will be publicly recognized. The Pennsylvania State Police will be represented. And the center piece is a soccer double-header. At 6 PM amateur side Newtown Pride FC of region 1 of the USASA will play a professional side from Bethlehem Steel FC of the United Soccer League. 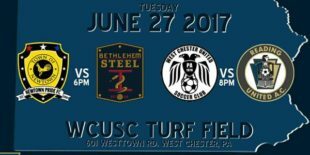 At 8, the NPSL’s West Chester United will challenge Reading United of the Premier Development League. In addition to benefiting the individuals and the agency named above, an unstated underlying purpose is to remind many of us of our good fortune in not having to confront such challenges. Bethlehem Steel center back Hugh Roberts quietly but eloquently pointed that out in an interview with PSP last week. It is also an opportunity for the participating clubs to connect with the local and regional communities in ways that strengthen bonds and do good beyond the usual effects of the beautiful game. Steel players Chris Nanco, Charlie Reymann and Matt Mahoney all articulated different facets of that idea in the same interview. Awareness and assistance are responsibilities tasked to the social service agency providing that secular ministry, Newtown Youth and Family Services. The Svanda-Santangelo team had scheduled a similar event in Newtown last season, but Mother Nature intervened. So, they rescheduled for West Chester this year. The changed venue takes full advantage of West Chester United’s connections in the eastern Pennsylvania soccer community. Steel head coach Brendan Burke and Troy Schneider of Reading United were already well-connected to coach Santangelo, and they have replaced the New York Cosmos and the New York Red Bulls organizations as participants in the double-header, a solution that was obvious and easy according to Burke. The spirit and support of the West Chester United organization from Board of Directors through technical and front office personnel mobilized the local specifics, together with the Eastern Pennsylvania Youth Soccer Association and the Eastern Pennsylvania Soccer Association. The Svandas achieved similar results in southwestern New England. The Svanda-Santangelo relationship began in 2015 at a regional championship USASA game won by West Chester United Majors the year Santangelo’s men went on to win the USASA’s Werner Fricker national championship cup. They are considering repeating the benefit event further afield in the future. If they do, an embryonic grassroots tradition of awareness-and-assistance benefit games will be arising in the United States. I, too, am a southwestern Ohio buckeye transplanted to Chester County! Have you heard of Xenia? !